I new to z-uno but familiar to arduino. I thought that I just could hook it up to pinout 13 and run it with the relaycontrol example. But I cannot seems to get it to work. The 13 pin is always HIGH, but led LED on z-uno reacts to domoticz commands (On/Off). It sounds strange... If you see that LED changes its state it means that PIN13 changes its state too. You can check it via multimeter. White LED connected directly to PIN13. May be you connect relay control to another PIN? PIN13 = PW1 (see http://z-uno.z-wave.me/technical/pinout/). after ZUNO_SETUP_CHANNELS macro in your code for debug purposes. I think I figured it out, but I don't know why it appears... But when I drive my relay board with 5V it is always on, but when I change to 3V it react as it should do... Does anyone know why? 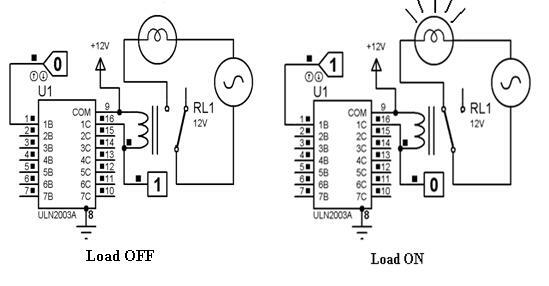 You have to control relay via its nominal voltage. I don't know what schematic was used for your relay module, but by default Arduino Uno use 5V logic, when Z-Uno use 3.3v logic. To control it you can use some attional drivers: channel transistor, darlington array etc. The most simple way is to connect module via ULN2003. Here is an example https://www.elprocus.com/wp-content/upl ... nd-Off.jpg. Replace 12v to 5v in schematics and all will be ok. Another way is to use 3.3v compatible relay modules (any modules/shields for cortex-based boards, shields fo RaspberryPi use 3.3v logic too). You have “if (newValue>1)”. Did you want “0”?